The RAID tower III is a compact RAID storage system that include many features come in larger RAID towers. As many as five 3.5" SATA hard drives can be installed into the RAID tower III. The small foot print, silent operating and large storage capability of the RAID tower III make it the ideal solution for a wide variety of storage applications in small businesses and homes. Once the drive is installed, it can be configured as a RAID set or as individual drives and connect to the computer via a single High speed eSATA connection. The RAID tower III can become a NAS device (network attached storage) by attaching to the Addonics NAS 3.0 adapter. This RT3S5HEU3 comes with everything you need to connect it to the computer. 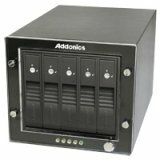 If you have any questions about this product by Addonics, contact us by completing and submitting the form below. If you are looking for a specif part number, please include it with your message.